Sure, you could pick up a box of pancake mix at the store, but homemade pancake mix is easy and inexpensive to make. 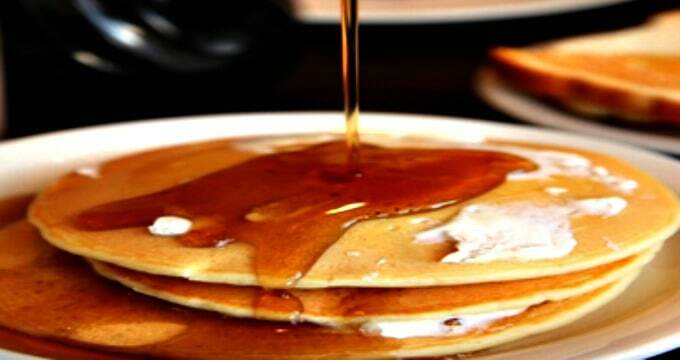 Nothing says “Welcome to the Weekend” like a stack of fluffy pancakes drizzled with homemade syrup. They’re a great make-ahead breakfast, too: just freeze them individually on a cookie sheet then pop them into a freezer bag. To serve, defrost in the microwave or toaster. Minimize messes. Make the batter in a large measuring cup or bowl with a spout to make pouring the batter easy. Don’t be hasty. That first pancake almost always fails for everyone, because most of us don’t wait quite long enough for the griddle to completely heat. To know if yours is ready, hold your hand two inches above the griddle’s surface — the griddle is ready when you can hold your hand there longer than 2 seconds but not longer than 5. Adjust the heat often. Once you start cooking pancakes, later batches will cook faster as your pan continues to build heat. Turn the temperature down and add oil or butter as needed, always using your hand to perform the griddle-check test above before starting a batch. Create fun shapes. My kids may be older but they still love it when I use pancake rings to make fancy designs, or a pour the batter into a squeeze bottle to write their names. It’s a great way to get them smiling in the morning — something that’s not always easy to do! Stir in fun flavors. 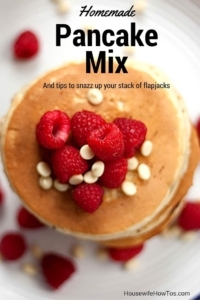 You can also make pancakes extra-special by stirring in 1 cup of frozen berries, sliced bananas, chocolate chips (white or dark) or even crumbled bacon into the batter — or just sprinkle them on. Serve topped with fresh fruit and whipped cream for a decadent breakfast. Nothing says "Welcome to the weekend!" like a pancake breakfast but what if you want pancakes on a weekday? Put together this shelf-stable mix to keep on hand and you can start any day easy like Sunday morning. 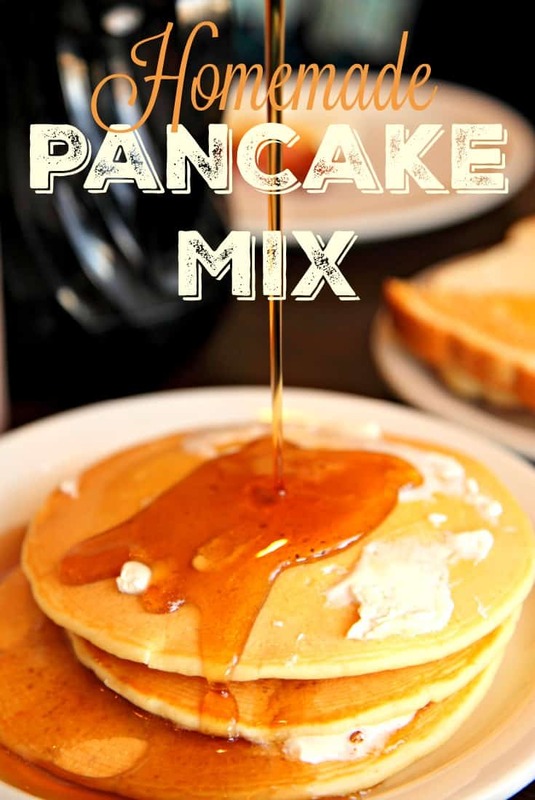 To make the pancake mix, combine the listed ingredients in a large bowl. Stir until thoroughly combined, then transfer to air-tight container and store up to 6 months. To make the pancake batter, shake the container of pancake mix well since contents may have settled during storage. Then stir together the mix, egg, and milk in a large measuring cup or bowl with a spout. Do not try to get out all lumps -- they'll burst during cooking and give your pancakes a fluffy texture. 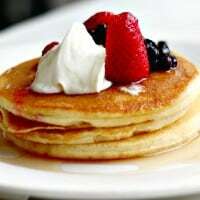 To make pancakes, heat a griddle or skillet over medium heat. Add butter or spray with cooking spray to prevent sticking. Pour batter in 3-inch circles, leaving at least one-half inch between circles, and cook. Flip with the edges are dry and bubbles begin appearing on the surface. Cook another 10-15 seconds and transfer to a plate to keep warm. Continue cooking, adding more butter or spray to the pan as needed, until the batter is gone. Serve with syrup or whipped cream and fruit as desired.